He was Joniko in the movie "Joniko and the Kush Ta Ka"
aka "Joniko and the Kush Ta Ka"
Amazing scenery, close encounters with wildlife and the story of a young boy and a Tlinget legend came together in 1969 with the release of a movie produced in Alaska by Alaskan film makers. The movie was originally titled "Joniko and the Kush Ta Ka". Written, produced and photographed by Juneau film making legend, Chuck D. Keen. The movie was directed by Ford Beebe Jr. who was an assistant director on such Disney classic animation movies as "Fantasia", "Snow White" and "Pinocchio." Mike and Mary of Anchorage Memories caught up with Tony Tucker Williams, who played the title character in this Alaskan movie. Tony, how old were you when you made the movie, "Joniko and the Kush Ta Ka"? "I was nearly 14 years old. And we didn't finish shooting the movie until I was 15." How were you cast in the title role of Joniko? "Chuck D. Keen, the Producer of the movie, advertised in newspapers all over Southeast Alaska. So I had pictures taken of me from all angles, then I wrote him a letter telling him how much I wanted to be an actor." "I ended up auditioning when Chuck came to see me. He had me look over the script and he asked me if I could memorize things I read. Then he had me read some of the scenes for him." Did you rehearse before they started making the movie? "No, I just read the script and then we started making the movie." How long did it take to shoot all of your scenes? "We had to travel to a lot of different places to shoot all the scenes. It took about a year." What was it like working with your director, Ford Beebe? "He didn't talk to me that much. He would write out some action, then he would hand me the script pages. He didn't give me much direction." Did you know that Ford Beebe had worked on animated Disney movies like Snow White and Pinocchio? "No, I had no idea what his background was. Just that he was a writer." What was the hardest part of playing Joniko in the movie? "Getting close to the whale!" "There is a scene in the movie where I'm very close to a whale." "The whale showed up, so they kept getting me closer and closer to this whale and I said, "wow, I'm nearly on his tail." Did you know about the Kush Ta Ka before making "Joniko and the Kush Ta Ka"? "Yes, I aleady knew about it. I had heard people telling the stories and I had talked with them about the stories." Kush Ta Ka means "land otter man" and it is a shape- shifting creature in Tlingit and Tsimshian folklore. It's been a lot of years since you make the movie. Do you still remember what it was like, shooting some of the scenes? "Yes, the bear scene had the bear right next to me. It was a wild bear and I was scared." Tony, did you attend the premiere of "Joniko and the Kush Ta Ka? "I attended the premiere, but I left with my friends about half way through the movie because after the movie they wanted me to get up in front of the theater audience and talk. I didn't want to do that so I left." What did your friends think about you being in a movie? Today, are people surprised when they find out that you were the star in a movie made in Alaska? "Yes. Sometimes people still call out "hello Joniko" to me. When they do, it brings back good memories." "Joniko and the Kush Ta Ka" was the last movie Tony Tucker Williams ever appeared in. Instead of making movies, Tony became a commercial fisherman, working as a set netter. And while Tony is retired now, he still has great memories about the time he and Chuck D. Keen and a bunch of other Alaskans got together to bring "Joniko and the Kush Ta Ka" to the big screen. 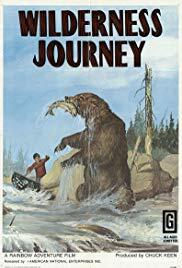 When the movie was sold to a film distributor, Pacific International Enterprises out of Oregon, the distributor changed the movie's title to "Wilderness Journey." Our thanks to Tony Tucker Williams for his participation in this story. Join in and write your own page! It's easy to do. How? Simply click here to return to Anchorage Entertainment Memories.